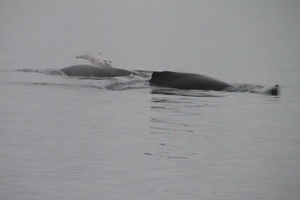 It’s my understanding humpback whales played around our ship all morning. Nicole and I slept right up until our 7:30 kayak briefing, so we missed the action…shucks. We had time for breakfast with Greg though. 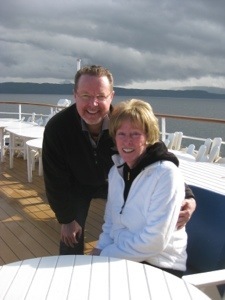 He and his wife Cathy are from Arkansas and own five car dealerships around the southeastern states. We had dinner with them the other night as well. 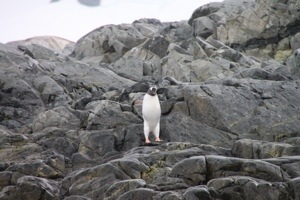 They are staying in the owners suite, and he was curious to know what our cabin was like. For any boat I’ve been on, I thought our room was quite luxurious until I heard they had a spa tub, kitchenette, and large closets in their room! Anyway, they are a fun couple. Another ridiculously placid day was in the works for us, thus another fantastic chance to kayak despite the intermittent overcast sky and spitting rain. Anytime it’s not windy, kayaking is a must! The cloud cover kept the temperature quite warm, relatively speaking. 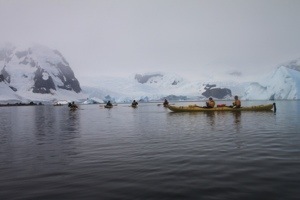 While the majority of the ship passengers walked around Cuverville Island looking at colonies of Gentoo Penguins who had a variety of chicks at different ages, the kayakers circumnavigated the island. 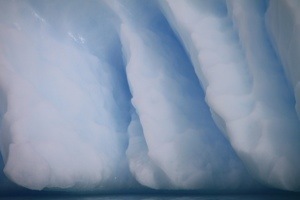 The conditions were simply amazing. 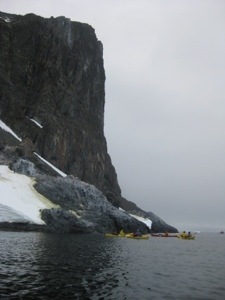 We floated around the backside of the island through the Errera Channel where cliffs covered in algae and lichen towered above us. 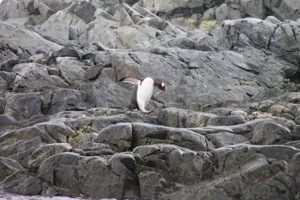 Away from regular human visitors, the penguins were quite shy. 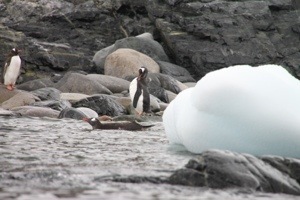 They sometimes waddled away from the shore as the kayaks approached, while in my previous experiences they were either inquisitive or indifferent. It was like the area was untouched, and ten kayakers and our guide had this vast expanse of land and nature to ourselves. 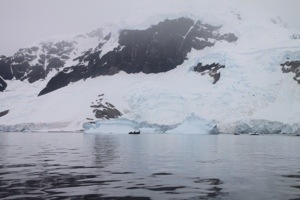 Even our support zodiac, this time with Karin driving, was almost invisible around the corner. 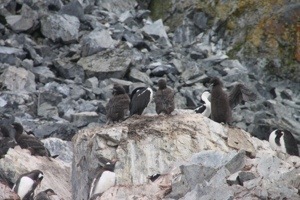 In addition to nesting penguins, we saw nesting cormorants and their chicks. 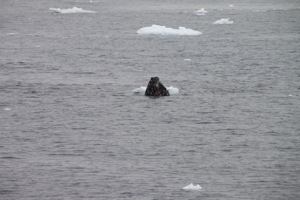 Once in a while the cormorants buzzed the surface of the water while the penguins porpoised through it. 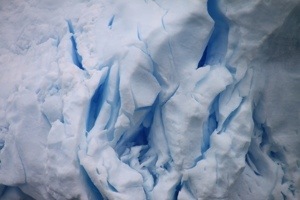 A tall glacier stood across the channel, opposite the steep, colorful cliffs, while aqua icebergs peppered the center of the channel. I snapped a photo of the zodiac just for perspective and it appeared as a speck. It’s hard to describe the feeling of majesty and tranquility simultaneously. 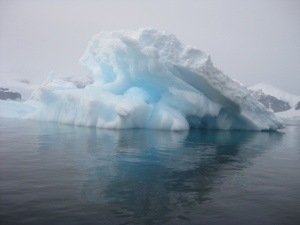 The only sounds to break the silence were a honk of a penguin, the trickle of running water perhaps from melting ice, and an occasional boom like dynamite exploding from ice calving off the glaciers. Can you find the zodiac? 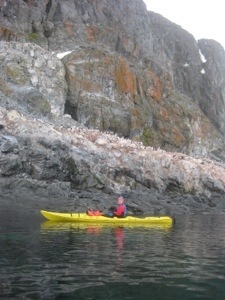 After rounding the bend, we inspected a small rocky island where kelp gulls nested near an old water boat. 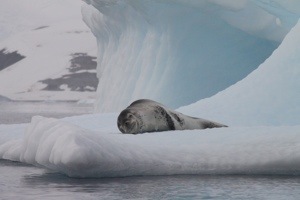 And just past the island, we spotted a leopard seal sprawled out on an ice floe. 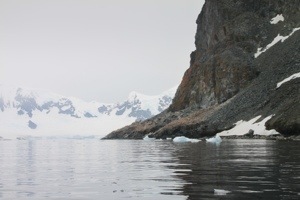 From here, with the permission of Karin, I ventured a little way from the group because I wanted to check out the beautiful blues of some ice cliffs when a raft of fifteen penguins came porpoising right at me. Once I caught up to the paddlers, several asked me if I got a picture. When I responded, “I did not”, they seemed surprised. 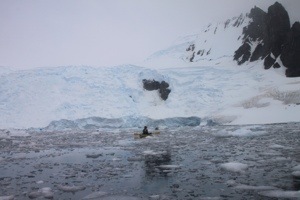 There is quite a lot of overhead taking pictures with a good, digital SLR while on the water while the clouds are spitting rain – set the paddle down, take off wet gloves, get the camera out of the dry bag, try to keep the lens dry or wipe it down, and then aim at the penguins zipping in and out of the water without tipping over. I got all splash by the time I was ready. They are fast little suckers when swimming! 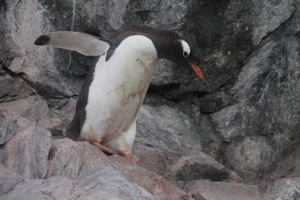 We paddled to shore to enjoy the Gentoo colonies like the rest of the passengers, only we had too much water this morning and didn’t work up the sweat we did yesterday, so our bladders were bursting. 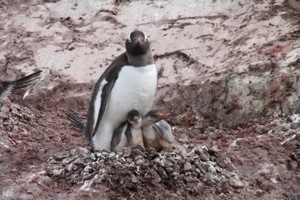 We could have walked around the island for 45 minutes admiring the small chicks and seeing the eggs, but we endured the ammonia stench for about ten minutes, got a few good photos, and boarded the bursting bladder, express zodiac back to the ship. It still takes a good ten minutes to get out of our dry suits, as Cheli said she wanted them to remain dry! The nice weather warranted a BBQ for lunch at the stern on deck five. A hat was required to eat…there was a contest for the most creative and the winners received a “prize of immeasurable value”. Some passengers came up with interesting ideas including putting a roll of toilet paper on their head. The staff had the music jamming. 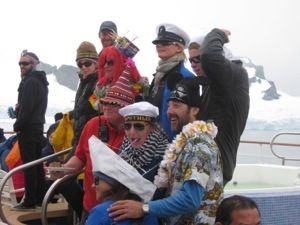 I must say, the voyage has remained fun in countless ways. 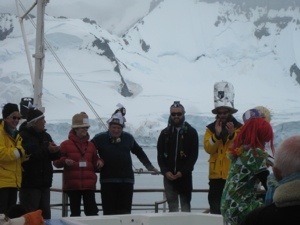 Even last night, the staff told a night time story that had nothing to do with the Antarctic. I can’t say what it was about because I didn’t go, but there is always something going on around here. I’ve hardly have enough time to blog! It seemed hard to top the morning, but the afternoon was amazing as well. 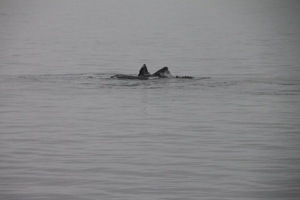 The humpbacks ended up hanging out with us all day. 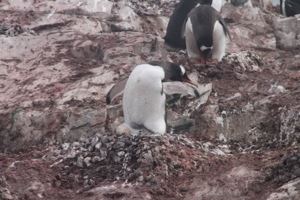 They were in the Antarctic for the summer to feed on krill. 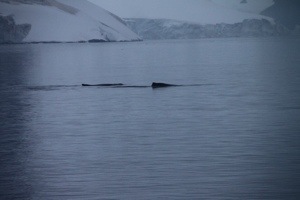 They swim from Australia while pregnant to Antarctica to feed then all the way back to Australia to give birth and then all the way back to Antarctica the next summer with their calf to feed. They don’t feed while birthing or swimming! 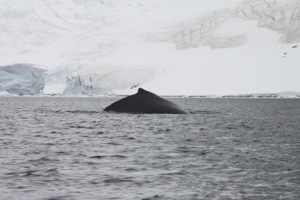 Thus it is a feeding frenzy when they are in Antarctica, and the krill become a very important factor in the life of the humpback. 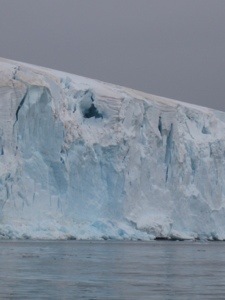 If it is a bad season for krill that live off the algae on the Antarctic ice, then it is difficult for the whales. During the lifespan of a humpback, that can live 50 years, it will swim the distance equivalent from the earth to the moon and back! Before we disembarked for our second paddle of the day we watched a humpback raise its head above the water, check us out, and then swim beneath the ship! Then, we loaded into the zodiac for our afternoon kayak at Orne Harbor, and Dave, aka the whale whisper, on the count of five called the humpback to the surface right next to us! We snapped some photos from the zodiac and then jumped in our kayaks and watched as this humpback dove deep with its fluke raising out of the water and then surfaced again some 30 yards away. 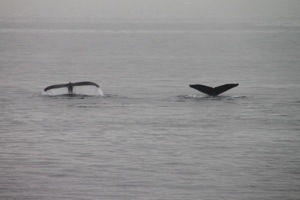 The humpbacks are so much slower than the Minkes and so graceful! Some zodiac riders got an even more special treat. Humpbacks sometimes feed by bubbling which means they blow bubbles around their prey. One zodiac got “bubbled”‘ so the passengers had to stomp their feet. 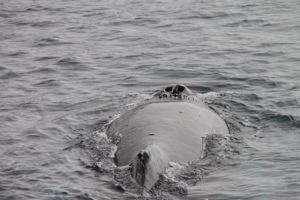 The humpback came up to inspect and slapped its fluke a few times. I think that may have been on the way back to the ship from our morning activity, but the humpbacks just seemed to stay with us all day! We saw them feed while we were on the ship later too. They breached the surface with their giant jaw open and their baleen open catching food in their mouths and filtering out the water. They rolled on their sides like synchronized swimmers. 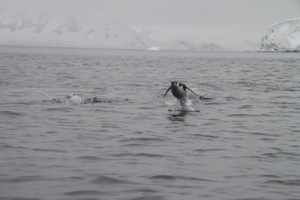 We even saw two dive down at the same time and flip their flukes up in a pair! 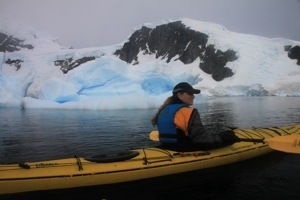 But I digress, back to our kayak. 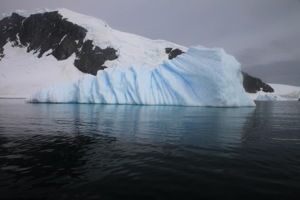 There were three options for the passengers at Orne Harbor – a Zodiac cruise, a hike on the Antarctic Continent up to a ridge to see Chinstrap penguins, or to kayak. 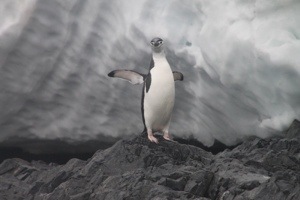 The Chinstrap penguin has a stronger tail than some of the others, so it is able to climb to higher areas than the others. Clouds were rolling in and out, so it was a risk for the hikers as to how their view would be, but we learned it was spectacular from Marion and Bev, as they opted for the steep hike as opposed to kayaking. 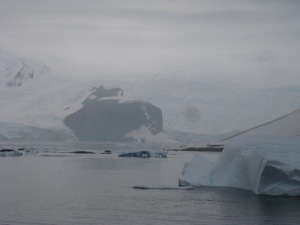 This was the first opportunity to be on the Antarctic Peninsula, which was also a glacier. In addition, Bev was camping later and wanted to save some energy for the evening activity. Can you see the hikers? 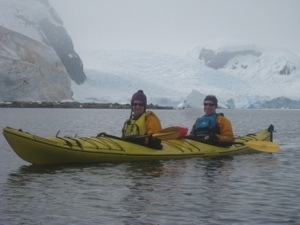 After we kayaked with the humpbacks, we paddled into the sheltered harbor, through the brash ice, and then around the coastline. 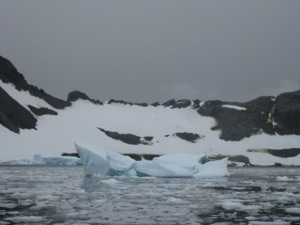 We saw part of a glaciated cliff crash into the water which sounded like thunder as it calved off the ice shelf, an iceberg roll, a small waterfall trickle down the towering cliff, penguins jump from rock to rock, and cormorants protect their nests. 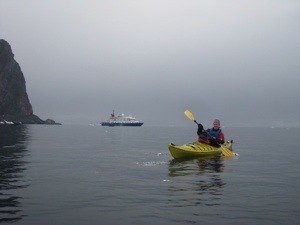 After playing in the harbor, we paddled out to open water to watch the whales that had traveled into the distance. 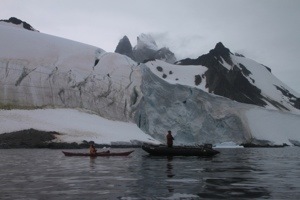 We had been on the water about two and a half hours – in fact each paddle had been about that long, so the zodiac picked us up and took us back to the ship. 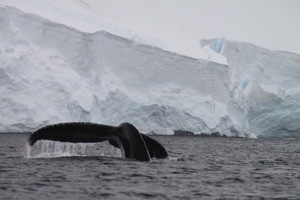 We enjoyed a relaxing evening tonight…dinner, looking through pics, and again watching humpbacks (a mama and her calf) while 40 other passengers went camping in the rain at Danco Island. We tried to camp, but only made it on the waiting list. Now I’m kind of glad we didn’t make it. There are not enough tents to go around, so most have to sleep in there sleeping bag covered in a bivvy bag, a waterproof cover. Your pictures are amazing! I do not want this trip to be over !! Thank you! Another wonderful day Beth. You are an excellent blogger for sure.